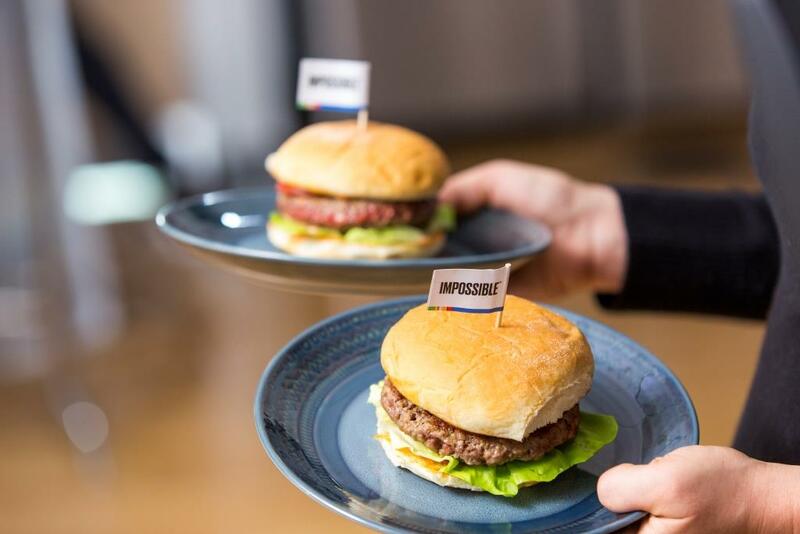 08 Jan 2019 — Impossible Foods has launched its first major product upgrade this month – an all-new recipe – which, according to the company, delivers “unprecedented taste, nutrition and versatility.” The new plant-based Impossible Burger contains no gluten, hormones or antibiotics. The new recipe makes its debut in the US today and is also expected to be available in grocery stores in North America later this year. Regarding the recipe itself, the company notes that it is kosher and halal-certified. It works well in any ground meat dish, including stews, chili, sauces, braises, minces, meatballs, meat pies or any other meat-based dish. It can also be used on the BBQ, in a crockpot, steamer or casserole and in recipes from lasagna to lo mein, reports Impossible Foods. The new Impossible Burger is claimed to have as much bioavailable iron and high-quality protein as a comparable serving of ground beef from cows. In addition, it has no cholesterol, 14g of total fat and 240 calories in a quarter-pound patty. In comparison, a quarter-pound patty from cows has 80mg. cholesterol, 23gs of total fat and 290 calories. Starting today (January 8), many of America’s most influential chefs will begin serving the new recipe in their restaurants. Starting February 4, the new recipe will be available to all restaurants in the US through major food distributors. At that point, restaurants will automatically get the new recipe when they place their next order and by March nearly all Impossible Foods customers should be serving the new recipe to diners. The Impossible Burger is currently available at more than 5,000 locations in the US, including Umami Burger, Bareburger, Wahlburgers, The Counter, Fatburger and Gott’s, as well as White Castle, America’s original fast food restaurant and home to the Impossible Slider, celebrated as one of America’s best burgers. The Impossible Burger is also available in more than 100 restaurants in Hong Kong and Macau. 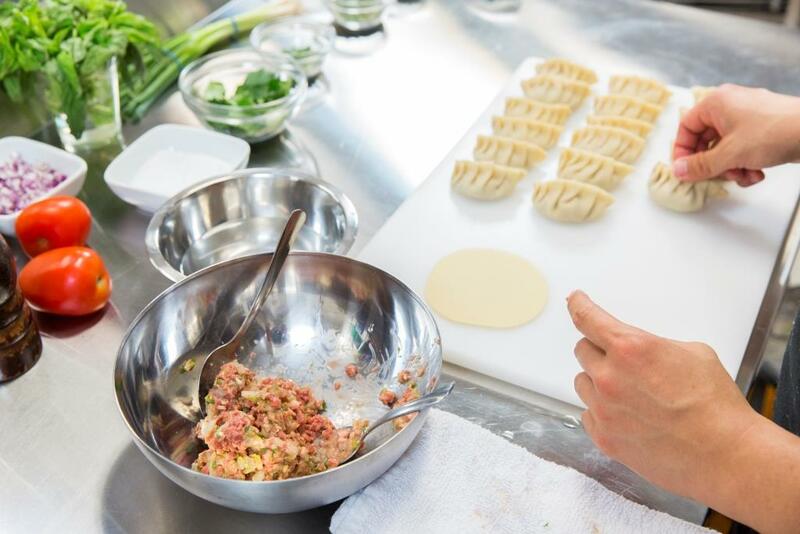 The company plans to launch the new recipe in Singapore within several months, with additional markets to come. Based in Redwood City, California, Impossible Foods uses modern science and technology to create wholesome and nutritious food, restore natural ecosystems and feed a growing population sustainably. The company makes meat directly from plants – with a much smaller environmental footprint than meat from animals. Shortly after its founding in 2011, Impossible Foods’ scientists discovered that one molecule – “heme” – is uniquely responsible for the explosion of flavors that result when meat is cooked. Impossible Foods’ scientists genetically engineer and ferment yeast to produce a heme protein naturally found in plants, called soy leghemoglobin. The heme in the Impossible Burger is identical to the essential heme that humans have been consuming for hundreds of thousands of years in meat. While the Impossible Burger delivers all the craveable depth of beef, it uses far fewer resources because it’s made from plants, not animals. This week’s launch marks the first major product upgrade from Impossible Foods and comes after years of research – including frequent, third-party taste tests on the West Coast, Midwest and Mid-Atlantic with consumers who self-identify as heavy meat eaters. The tasters each eat a “naked” Impossible Burger (without condiments or buns) and then rated the patty on “likeability.” In separate tests, consumers gauge likeability for a similarly plain patty from a cow (made with conventional “80/20” ground beef from a major grocery chain). 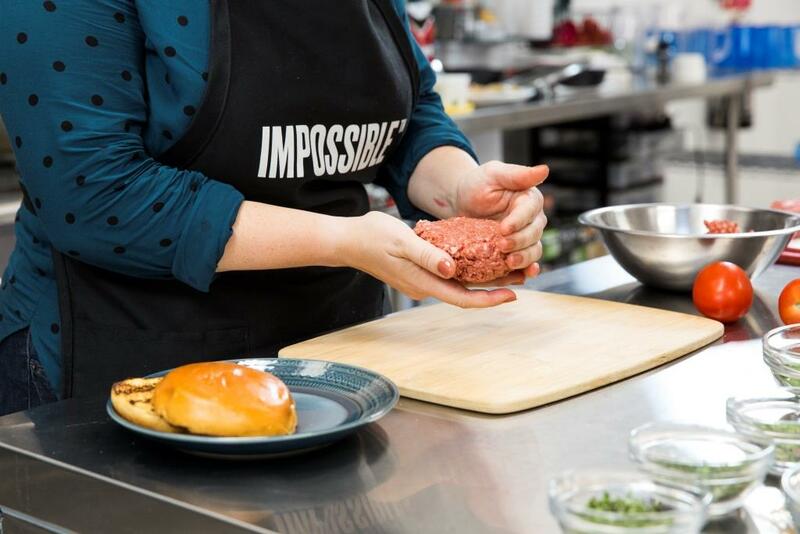 And later this year, Impossible Foods plans to launch the next-generation Impossible Burger in select US grocery stores. That means that millions of home chefs will be able to enjoy the Impossible Burger’s industry-leading taste and functionality – attributes that can’t be found in any other plant-based product. The new recipe gets its meaty chew and versatile texture from soy protein, not wheat protein – a response to consumers who loved the original Impossible Burger but wanted no wheat or gluten. 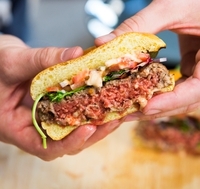 “Impossible Burger fans told us loud and clear they wanted a gluten-free burger that was at least as nutritious as meat from animals,” comments Impossible Foods’ Vice President of Nutrition and Health, Dr. Sue Klapholz. “Our new product delivers all the taste meat lovers crave – without compromise to nutrition or the planet,” she concludes.